A song I wrote the morning Pete Seeger passed, inspired by his 1955 testimony before the House Committee of Un-American Activities (HUAC). Pete was courageous! Neale Eckstein has just made a gorgeous video to Lady Of The Harbor. Check it out on You Tube! This is the song I wrote for the Warriors Heart to Art retreat in 2014. 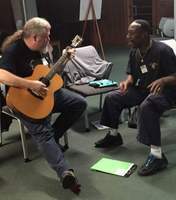 Thanks to all of the Veterans at Warriors Heart To Art for courageously sharing your stories and consenting to have the thresds of those ideas and experiences woven into the fabric of this song. You are rememebred with gratitude and deep respect.